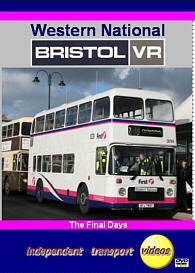 December 9th 2006 was the final operating day of the closed top Bristol VRT with FirstBus. A special event organised by First Devon & Cornwall Ltd. to mark the occasion took place in Penzance and our cameras were on hand to record it. This programme begins at the start of 2005 when we made a visit to record the VRs in regular service. We follow 38872 (LFJ 872W) on service 1 from Lands End to Penzance, running through the Cornish countryside so familiar to these buses. We then take a ride on 38867 (RAH 267W) to Parr Sands on service 2 to connect with 38608 (XDV 608S) for a run back to Marazion. Here we board Tilling liveried 1141 (AFJ 706T) for ride to Porthleven on service 2A. We leave spectacular Porthleven on 1141 as it returns us to Penzance to join 38747 (AFJ 747T) for service 1 to Lands End. From Lands End we travel on 38747 to Sennen Cove now deserted and wind swept! Night falls as the welcome sight of 38807 (FDV 807V) comes into view down the steep hill to the sea front to pick us up for the run to Newlyn. Our final ride of the day is again on 38747 for the run back to Penzance. The weather on this January day was mixed with sunshine, high winds and later rain – all this adding to the atmosphere. There are depot visits to Penzance, Camborne, St. Austell, Torpoint and Plymouth – recording all the VRs that were still available for service. The finale of this programme is filmed on December 9th, the final Bristol VR running day of the erstwhile Western National fleet. The scene opens at Penzance bus station with the two remaining closed top Bristol VRs, 38749 (AFJ 749T) and 38873 (LFJ 873W) recently refurbished – helped by convertible ‘1003’ (VDV 141S) as ‘stars of the show’. They were in the company of a number of ‘guest’ preserved VRs invited for the day. As part of the celebrations there was a Cavalcade through the streets of Penzance. This video has to be in your collection if you want to keep the memories alive of these remarkable vehicles. Duration : 115 minutes (approx).